InterSystems recommends that only one ESB production should be running on an Ensemble instance. For ESB systems that require very high throughput, you can reduce the overhead of processing a request by eliminating the persistent messages. The persistent messages are the object that is sent from the pass-through service to the pass-through operation and the object returned by the operation to the service. These objects are stored in the Caché database. These persistent messages are very useful in tracking and reporting on the calls processed by the ESB and in troubleshooting any problems. But creating these objects requires resources and for systems with very high throughput, the storage required for these objects can be very large. To maintain the system, you must frequently purge these messages. You can suppress the use of persisted messages to gain efficiency at a cost of reduced flexibility. See Suppressing Persistent Messages in Pass-through Services and Operations for more information. If you are running a HealthShare product, the HealthShare service registry is distinct from the Ensemble service registry. The HealthShare service registry provides a similar capability to the Ensemble External Service Registry. In most cases you should continue to use the HealthShare service registry and not use the Ensemble External Service Registry. Create an Ensemble namespace to contain the ESB production and the Service Registry. 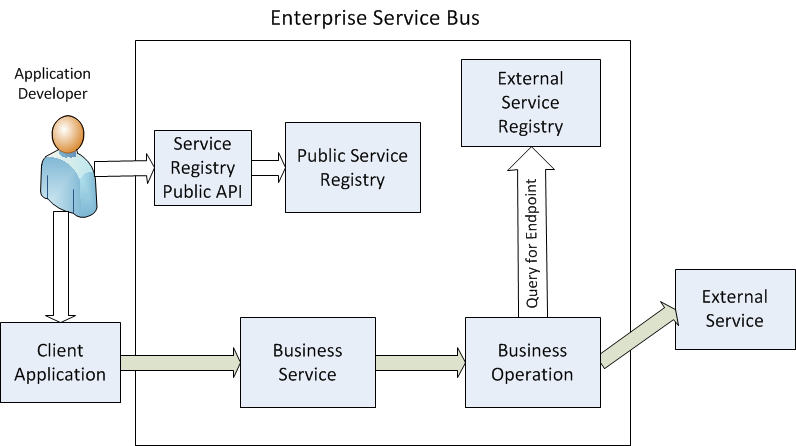 Create the roles and users needed to access the Public Service Registry through the Ensemble portal and through the public REST API. See Overview of Configuring Ensemble as an ESB for details.